Although not related structurally to macrolides, the lincosamides have similar antimicrobial activity and act at the same site on the bacterial ribosome to suppress protein synthesis. The lincosamides are bacteriostatic or bactericidal, depending on the concentration. The lincosamides have activity against many gram-positive bacteria and many anaerobic bacteria, but are not effective against most gram-negative organisms. Cross-resistance occurs between the lincosamides, macrolides, and streptogramins. 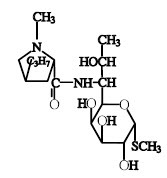 The lincosamide family of antibiotics includes lincomycin and clindamycin, both of which inhibit protein synthesis. They bind to the 50S ribosomal subunit at a binding site close to or overlapping the binding sites for chloramphenicol and erythromycin. They block peptide bond formation by interference at either the A or P site on the ribosome. Lincomycin and clindamycin penetrate most tissues well, including bone. Therefore, bone and joint infections caused by susceptible organisms respond well to treatment with lincosamides. These drugs also concentrate within phagocytic cells, which may offer a therapeutic advantage. Necrotic enteritis (Clostridium perfringens). Dosage The dose levels for lincomycin-Spectinomycin (L1:S2) in poultry is 30 mg/kg bw for intramuscular injection and 50-150 mg/kg bw via drinking water.